For boosting fitness, maintaining a healthy body weight, or keeping those feel-good endorphins flowing, nothing beats jogging. Whatever your level, it really is one of the most accessible forms of exercise out there – in every sense! But no matter whether your goal is to get fit or smash that personal best, it’s important to take care of your skin during and after exercise. Maintain that race face, with MYSA’s top tips for keeping your routine running smoothly – and find out why the LUNA range of facial cleansing brushes are skin-savvy runners’ brightest skincare secret! Our number one tip for running skincare? Go bare! By which we mean, of course: remove all makeup before you hit the treadmill or track. “When you work out, your pores and sweat glands open up in order to cool down your body,” explains Whitney Bowe, an M.D., dermatologist, and host of DermTV.com. “Wearing a full face of makeup can block your pores and glands, hindering your skin’s ability to breathe, which in turn can result in breakouts, blackheads and skin irritation.” No time to squeeze in that lunch hour run and fix your makeup? Recent years have seen an expanding range of non-comedogenic cosmetic lines – or ‘athleisure beauty’ – that won’t block pores. No, they’re not ideal – but they’re a whole lot better than compromising your running routine. We all know that when it comes to running, hydration is a must! Whether amateur or elite, drinking enough before you set out, topping up on the go, and rehydrating post-workout not only helps your body thermoregulate, it also lubricate joints and optimizes muscles, keeping cramps to a minimum and reducing risk of injury. But in addition to checking their water intake, skin-savvy runners should also ensure their skin is hydrated – particularly when exercising in cold, dry, moisture-sapping climates. Cold winter air, especially when combined with low humidity, saps moisture from the skin, leaving it dry, flaky, and irritated. Lock in that moisture and keep skin quenched by applying a light moisturiser both pre- and post-workout. There’s no better feeling than running outside in the glorious sunshine! But at any time of year, exposure to the sun’s harmful UV rays can damage skin. And no, we’re not just talking lines and wrinkles here. 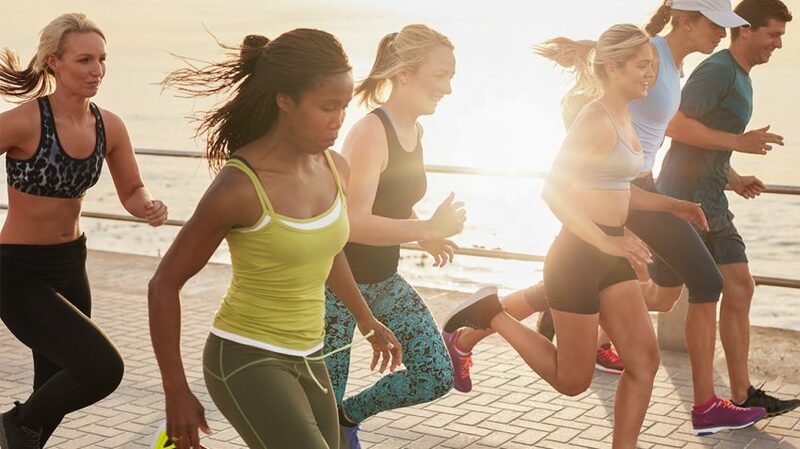 “Athletes experience an increased risk of all types of skin cancer due to longer exposure to sunlight,” explains US-based dermatologist Ronald Davis, MD. And while it may be easier to remember to reach for the sunscreen during summer months, overcast runs can be just as dangerous: according to Skin Cancer Foundation, “The dangerous days aren’t just the ones that are hot and sunny. Up to 80 percent of UV rays can penetrate clouds.” That means proper sun protection is a must – every time! For face and body, outdoor runners should look for water-resistant sunscreen formulas (we love Supergoop and Coola for being light, non-greasy, and quick to absorb), and for exercising in high-intensity sunshine consider a visor or hat. Sweating can be great for skin! “Sweat purges the body of toxins that can clog pores and plague the skin with pimples and blemishes,” explains Dr. Adebola Dele-Michael, dermatologist at Radiant Skin Dermatology and Laser in New York City. Your body’s natural cool-down method, sweating during or after exercise helps shift dirt and grime build-up in and around pores. That could be makeup residue, or air pollution particulate matter – think dust, soot and pollen, for example. In general, outdoor runners are exposed to much more of these than gym bunnies – particularly if their route takes them through urban areas (hello, exhaust fumes!). By sweating, you’re actually dislodging a lot of this build-up… but if you don’t remove it from your face pronto, you’re basically inviting breakouts. A flushed face after an invigorating run is completely normal, and yet another of the body’s clever cooling mechanisms. “Any activity that increases core body temperature is also associated with vasodilation, meaning that the blood vessels on the skin dilate in an effort to dissipate heat more readily,” explains Dr. Robin L. Travers, dermatologist at SkinCare Physicians, Boston. But while some of us may end our runs with the merest of rosy glows, for others, it can be full-on tomato face for hours! A lot of that depends on the intensity of your workout, as well as skin type or specific conditions, such as rosacea. To minimise a crimson complexion, help your body’s heat management along by staying properly hydrated pre-, during-, and post-exercise, and if you can bear it, hop into a cool shower right after your run. The LUNA range of facial cleansing devices are skin-savvy runners best friend. Shown to remove 99.5% of dirt and oil – including makeup residue – they’re ideal for a pre-workout cleanse, as well as removing sweat and pollution particulates after your run. Unlike traditional cleansing brushes, they’re made from soft, ultra-hygienic silicone, making them gentle on the face, and just the thing for restoring skin exposed to cold winds, or still flushed with post-run redness. They’ve also been shown to improve the absorption of skincare products – including moisturizer – helping skin lock in moisture and stay hydrated. Don’t let skincare concerns keep you from being your active, healthiest best. Look after your skin – and keep running!